Classic Tapestries have been sourcing and supplying beautiful, high quality, hand finished tapestries to our Australian and overseas clients since 2007. Classic Tapestries range of products includes wall hanging tapestries, tapestry hanging rods, cushions, unfinished panels, throws, bell pulls, table runners, fire screens, fabrics, tapestry purses, caskets, footstools and waste baskets. We pride ourselves on customer satisfaction. We can provide a personalised service to help our customers make the right choice. 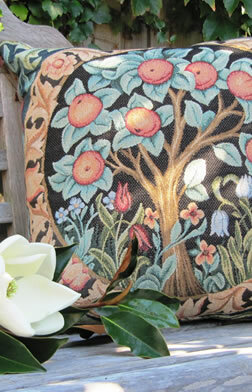 We recognise that the purchase of a high quality tapestry for some customers is not as easy as a 'click of a button'. At Classic Tapestries you can talk to an expert and get more information and comfort on your selection. You can contact us for a no obligation discussion on any selection from our site. Why Buy from Classic Tapestries? Quality – All our tapestries are sourced from Belgium, French and Italian weaving mills. Each piece is unique and hand finished with care and skill. We do not source mass produced reproductions which are mainly fabricated in Mexico, China or the USA. Customer Service – The people you talk to at Classic Tapestries own the business and pride themselves on building the company's great reputation. At Classic Tapestries we are passionate about all things tapestry. Our goal is to provide the highest quality products and best customer service. You can be guaranteed to talk to an experienced person and receive personalised old fashioned service. We can provide you with detailed information regarding where product is woven, and history of each tapestry. Also high quality colour catalogues of our product range are available for purchase online or even at the shop. We understand purchasing a tapestry or accessory can be an important decision. Let Shirley Sinclair help you by emailing her at sales@classictapestries.com.au or by telephone on 03 9844 0588. Our advice comes with a no obligation to purchase. Classic Tapestries have samples on display for customers to view in our shop. Range – Classic Tapestries have an extensive range of wall hanging tapestries and accessories. We have over 1000 products in our range. Our website is only a very small sample of our range. Please contact us if you are unable to find exactly what you are looking for. If you have a particular image of a product you are trying to source, please click here to send and we will be happy to do whatever we can to find the product for you. Price – We pride ourselves on supplying quality products at competitive prices. Payment Facilities – Classic Tapestries welcomes purchases online through our website, via telephone or via email. Telephone enquiries for advice are welcome. Payment can be made via the website securely, (including both Paypal or credit card) or via cheque, direct bank transfer or cash in person. Guarantee – We are sure you will be delighted with your Classic Tapestries purchase, if for some reason you are not completely satisfied we will refund the cost of the goods.